All the feels! No. 1 Chicago Cubs fan Bill Murray was in tears as his beloved team made history on Wednesday, November 2, winning the World Series against the Cleveland Indians and breaking a 108-year curse. And as fans celebrated the victory on Twitter, their initial thoughts were about the Ghostbusters star and his joyful response. Watch the winning moment and Murray&apos;s adorable reaction in the video above! "This makes me want to cry tears of joy. When Bill Murray is happy I am happy," tweeted one fan, sharing a GIF of the Oscar winner with a huge smile on his face and raising his arm in excitement. 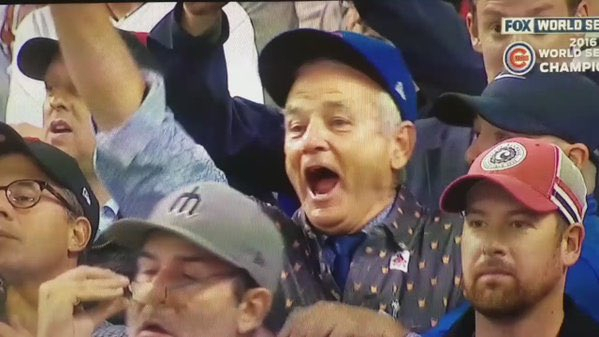 "Based on my Twitter feed I see that Bill Murray won the #WorldSeries," joked another. "We are all Bill Murray tonight," one fan summed up. "I just want to party with Bill Murray right now," wrote another. Referring to Murray&apos;s fellow Chicagoan and actor, one commenter warned, "Someone keep an eye on Bill Murray and @Johncusack tonight." The pair were spotted on the field with World Series Champion caps. "Bill Murray and John Cusack will prolly deny this later but there was some boo hoo-ing going on," an eagle-eyed fan wrote. "There&apos;s a @NBCsnl skit w/Will Ferrell as Harry Caray & Bill Murray that needs to happen this weekend. Maybe Vince Vaughn & @johncusack too," another fan wrote, referring to the late Cubs announcer memorably played by Ferrell on Saturday Night Live. Murray, 66, was almost as much of an event as the World Series itself. He sang "Take Me Out to the Ballgame" at Game 3, and on Tuesday, November 1, he gave one lucky fan a ticket to sit next to him to watch Game 6 in Cleveland. Check out some of the enthusiastic tweets below.